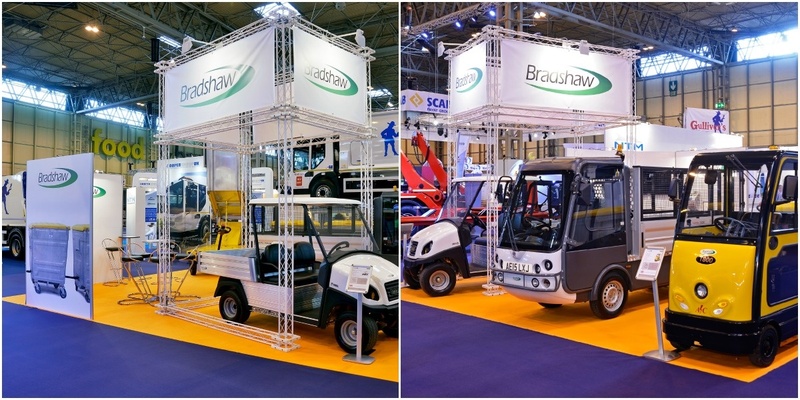 Bradshaw Electrical Vehicles will be exhibiting their innovative product range at the Resource Efficiency Management and Waste Solutions Exhibition (RWM 2015) at the NEC in Birmingham. The show takes place from the 15th to 17th September and you can find Bradshaw’s at stand 5V110. Celebrating their 40th anniversary this year, they are the largest UK-based manufacturer of electric vehicles, growing a loyal customer base across an ever-increasing range of industry sectors. Their products including tow tractors, load carriers, personnel carriers and pedestrian controlled vehicles are now used across a diverse range of industries including industrial waste movement and recycling. For more information on Bradshaw’s or to pre-arrange at meeting for the show phone them on 01780782621. GH Display have been supplying exhibition stand hire services to customers for over 40 years. Consequently we have a broad range of exhibition equipment hire options for you to choose from. Over the years we have built-up a huge stock of exhibition stand hire components that can be configured to create a truly custom exhibition stand for hire. Customers opting to hire exhibition equipment find that it gives them total flexibility without the upfront capital investment. It's a popular choice for those businesses wanting exhibit at different types and size events, without restricting themselves to using the same custom exhibition stand each time. We have some clients whose events mean that sometimes they will exhibit inside an exhibition hall and other times they will need to exhibit outside. Such a scenario requires a different type of exhibition stand solution and this is where hiring your exhibition equipment makes total sense. It also allows for businesses to experiment with different styles of exhibition stands to ensure that their design of custom exhibition stand reflects their brand, products or services effectively. To talk to us about our exhibition stand hire options please call us on +44 (0)1733 570222. To learn more about your hired display options visit our custom exhibition stands for hire page and browse our portfolio of bespoke exhibition stand designs. To obtain a quotation for a hired exhibition stand you can submit your exhibition stand design brief below.